Greetings all! I’m back from the dead, and I am hungry. Today I am starting a new series in honor of my brother, Mike. Recently he moved out onto his own, which means a diet consisting of lots of pizza, burritos and ramen noodles. Shortly after his move, Mike gave me his plea, “Tell me what I can eat!” He was in need of simple food he can make that would take much effort on his part. He is all about minimal effort. So, I give you Part 1 of “Feed my brother!” done all in one pan. Heat EVOO and butter in a skillet on medium-low heat. Add mushrooms to skillet and let cook, stirring occasionally. This should take 5-7 minutes. Do not season yet. 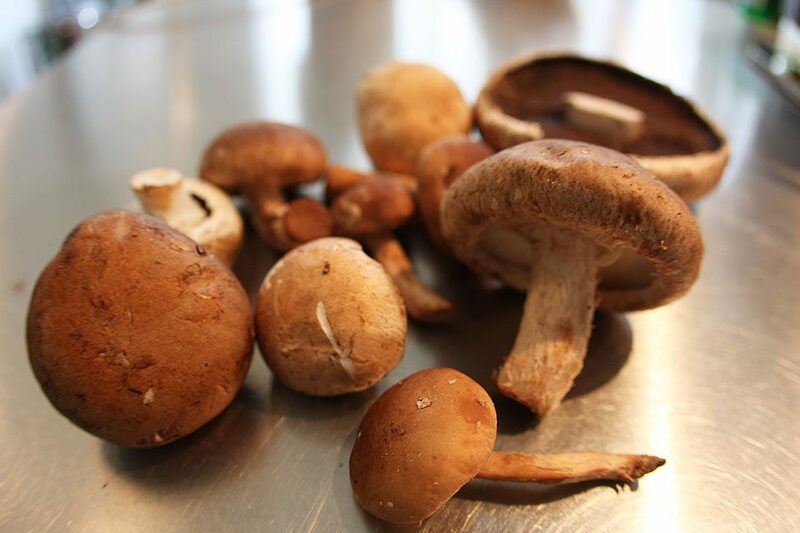 (Mushrooms have a lot of moisture to release and it is bet to season with salt after they have cooked down). Once the mushrooms are brown and wilted, season with salt and pepper. 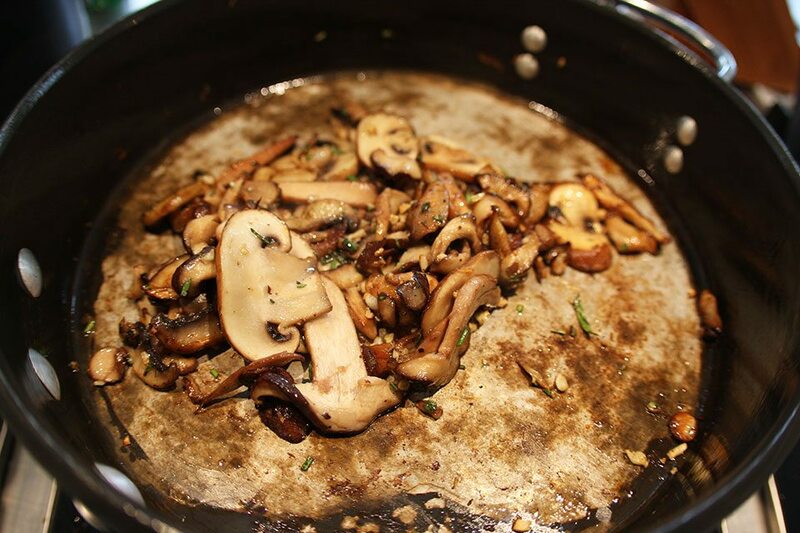 Push the mushrooms off to the side of the pan. Turn heat to low. Add garlic to cleared spot in pan. Add more EVOO if necessary. Cook garlic gently for 1 minute. Add rosemary and stir mushroom mixture to combine. Remove mixture from pan and set aside. Turn heat to medium-high. Drizzle each side of the baguette with EVOO and place face down in the pan to toast. (If you use the same pan, it soaks up the mushroom flavor from the pan.) Toast for 3 to 4 minutes until golden and a bit crispy on the edges. Assembly! 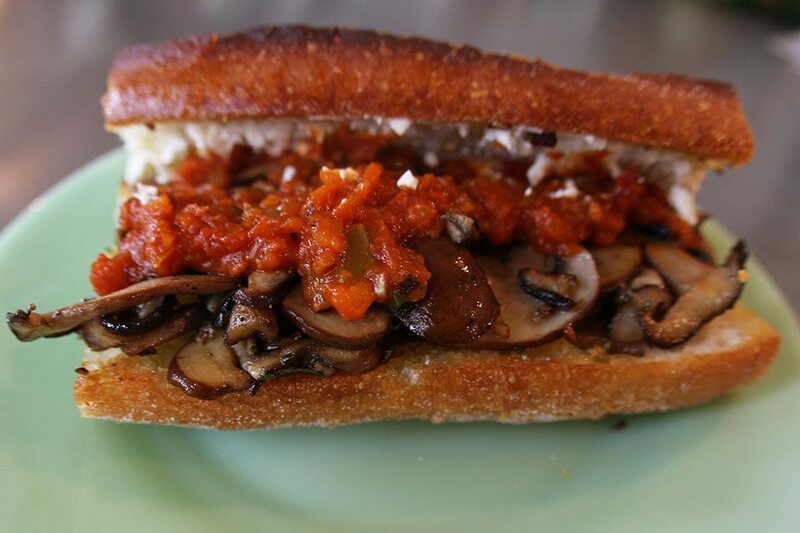 Smear one side of the baguette with goat cheese. Top with mushroom mixture. Top with tomato sauce. Stuff your face. This recipe makes two, so for those in Mike’s situation, think of it as a second course. If you have sauce on hand, but its not that thick, just cook on low in a saute pan to thicken. 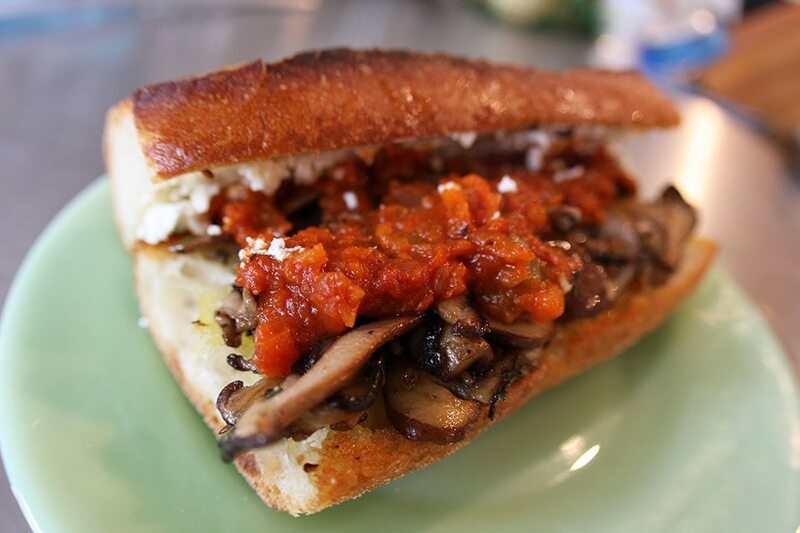 You could also substitute tomato sauce with juicy sun dried tomatoes. 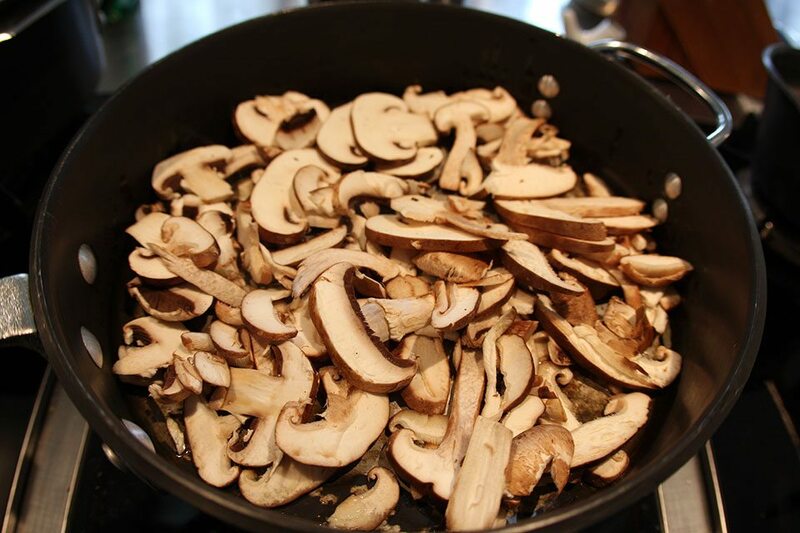 This mushroom mixture can be used in a multitude of ways. Make lots and add it to risotto, pasta, frittata, omelets, or oohhhhh, maybe a cold salad. Or in green beans! I’m done. Gotta love food tributes to me!